A healthy alternative snack or the base for some awesome nachos. Wash and peel sweet potatoes. With a sharp knife or mandolin, cut slices that are 1/8 of an inch thick or a touch thinner. In a skillet pan or wok add coconut oil and heat over medium- medium high heat, heating the oil hot enough that it is only slightly smoking. If there is a lot of smoke, it is way too hot. Working in batches, add 5-7 potato slices at a time. 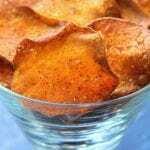 Turn chips a few times to evenly fry both sides. Fry for approximately 3-5 mins or until golden brown. Cooking times will vary depending on heat source. Once fried, place on paper towel to absorb extra oil and sprinkle with sea salt and chili powder.